After 3.1 miles of brisk walking today, I feel rejuvenated, not because of the work-out, but because of the reaction I received from business partners, family, friends and supporters of my political activism. Something else, so far removed from Gambian politics inspired me to further strengthen my resolve to continue the fight against tyranny, injustice, corruption and incompetence; that is short paragraph in aMoveOn.org Political Action circular celebrating Obama's victory in the Senate yesterday over opponents of the Iran nuclear deal that got me rejuvenated. In celebrating victory Political Action's Ben Wikler wrote in his circular the following: Today, we did it. The other side had tens of millions of dollars. Our side had millions of people. The other side had TV ads. We had facts. The other side had fear. We had courage. 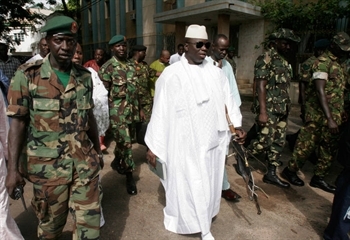 Jammeh with a battalion of armed men. I cannot help but immediately see in the statement, The Gambia, with Yaya Jammeh and his millions of dollars to pay lobbyists and certified con-artists (or 419s) to spruce up his battered image on the one side, and on the other side, us, and the Gambian people who are with us but are afraid to speak up. Their side with radio, television and propaganda outfits like the phony Kora Broadcasting Corporation on one side, and on our side the facts with sidisanneh.blogspot.com and numerous other online media outlet running on shoestring budget. The Jammeh side has fear. We have courage. "Fear rules" in the Gambia, and correctly concluded by Amnesty International and the moment we conquer fear, we have won the war. 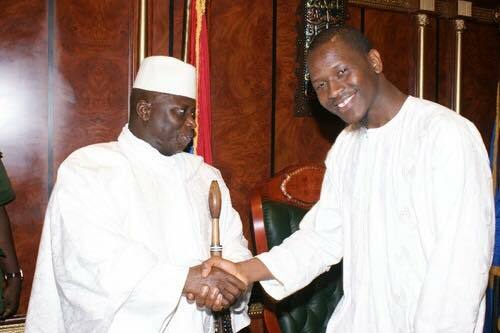 Jammeh knows that better than anyone. Thus he continues to employ tactics - he's lost the Strategy War - in a futile and desperate effort to regain the upper hand but we will not let him, no matter how may libelous publications he authorizes or slanderous utterances his supporters make in social media and elsewhere. The truth is with us, and we shall prevail, InshaAllah.